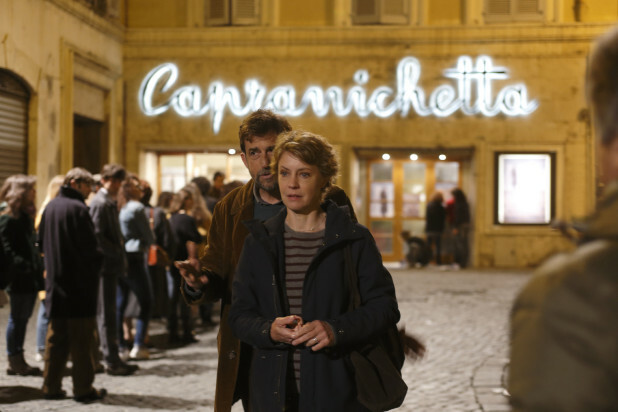 Nanni Moretti, a veteran at the Cannes Film Festival is back this year with what fits the description of a semi-autobiographical drama-Mia Madre (My Mother) —a movie which does not only throw light on the last stages of losing an aged mother to death but challenges the working lifestyle of most people which leads them to miss some of the most important things and truths of their lives. ‘Mia Madre’ is the third collaboration of the Italian film-maker with actress Margherita Buy, who plays his alter ego, a director dealing with an ailing aged mother, child-mother relationship and boyfriend crisis during a movie shoot. It’s brilliant how Nanni Moretti is able to touch the serious subject of a dying mother in a film which somewhat is perfectly laced with laughter, caused by Barry Huggins (John Turturro) who stands tall as an actor in the movie being shot by Margherita. ‘Mia Madre’ starts with actress Margherita, a director on set shooting a scene of angry protesters demonstrating against a factory lay off. It doesn’t get easy on Margherita’s set when she brings in Barry Huggins who plays an entrepreneur who has taken over the factory in crisis. On set, Barry Huggins struggled with his lines, a situation first thought to be a challenge due to the film being shot in a different language but later in the movie, it turns out that Barry indeed had a deeper problem with remembering his lines though he has managed this well to be successful in his career. Off the set of Margherita where Barry creates humor for the audience but headache for director- Margherita, the director is faced with double problems—you can even think of this as three solid problems. She has her dying mother on a hospital bed, she is kept in the dark by her teenage daughter on an early classroom love problem due to their non-existing relationship and her own love affair with her boyfriend collapses. In a wide contrast, Margherita’s brother Giovanni, played by Nanni Moretti himself adopts a different approach to life and the confronting issue of a dying mother. He takes a long absence from work to take care of the mother, spending almost each day by her hospital bed. Margherita on the other hand dealt with her busy shooting as it came and managed to see her mother after each shooting—sometimes, she would visit with anger, caused by on set problems. Emotionally, Margherita was no way ready to deal with the fact that her mother was fast dying—and perhaps, this was due to the fact she seems to have not spent enough good times with her mother as a result of her tedious film director job. Though the film subtly questions the lifestyle of most working people and settles on the need to have a balance, to find enough time for family and important relationships—it’s the attempt to highlight the lost part of people who feel trapped in a world of acting (living under false pretense) that is bold. For Barry, it’s just not about the fact he cannot remember his lines but the fact that he feels trapped in a world of acting, struggling to experience reality. And for Margherita, her emotional unpreparedness to deal with her dying mother was the obvious, so was her lack of dedicated time for her mother even in her last days—but the way she dealt with her entire life, relationships with others and her inability to acknowledge the flaws in her lifestyle and attitude is what made her job and those relationships she cherished far difficult to accommodate from the other sides.